The old eye chart of diminishing-sized letters used for vision screening might soon be a thing of the past, thanks to work by a University of Auckland student graduating this week. Mehrdad Sangi: “It’s amazing to see my PhD research developed like this." Research into automatic eye testing informs the PhD in Bioengineering for 33-year-old Mehrdad Sangi, who hopes his new method will be more effective in picking up issues earlier – particularly in children. Working on the basis that the sooner problems are detected the better the chances for treatment, Mehrdad has developed a new system that doesn’t need the patient to make a decision about what they are seeing. It’s amazing to see my PhD research developed like this. “The current letter-based eye charts used for vision screening requires the patient to be cooperative - which we know children aren’t always. And the old test is intrinsically subjective so again, it doesn’t always work for children,” says Mehrdad. His new system is based on ‘optokinetic nystagmus’, an involuntary reflex of the eyes that occurs when an individual sees a moving object or pattern. Subjects are shown a moving pattern on a screen, with a camera recording eye movement. This allows patterns to be measured and algorithms used to screen for visual acuity. 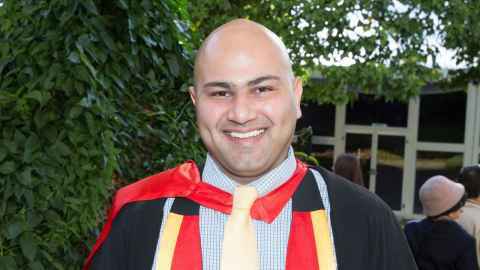 Mehrdad came to New Zealand from Iran in 2013 to do his PhD at Auckland Bioengineering Institute. He already had a Masters in biomedical engineering and an undergraduate background in electrical engineering, and was interested in looking at better ways to measure visual function in young children. As a result of his PhD research, Mehrdad founded a company called Objective Acuity (www.objectiveacuity.com) with his supervisors Dr Jason Turuwhenua and Associate Professor Ben Thompson. The product they are developing has already been in clinical trials with children in Australia, the United States and New Zealand.